I was travelling for business in Phoenix, Texas, a few years ago and went searching for saxophones. At the time the British Pound was at a very high exchange rate against the dollar, so I had been buying quite a few horns from America. I remember visiting three or four pawn brokers (savings and loan shops). This particular one sold mainly guitars and had several hundred on show around a pretty big store. 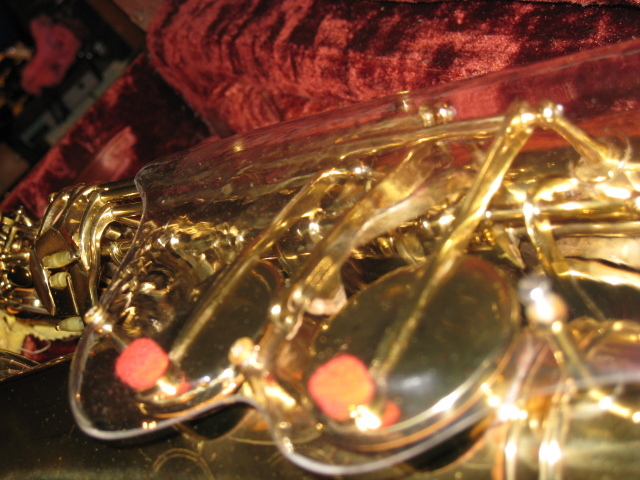 There was a glass display cabinet with six or seven saxophones in it and I had a look to see what was inside. This stood out as unusual at the bottom left hand side. The shop assistant got it out for me. I was immediately surprised that it had a plastic keyguard and was made by Conn. It didn’t look like any of the others I had or had seen. Conn, of course, was the most prolific saxophone maker. It was only when I got it home that I found out it was a 28M. 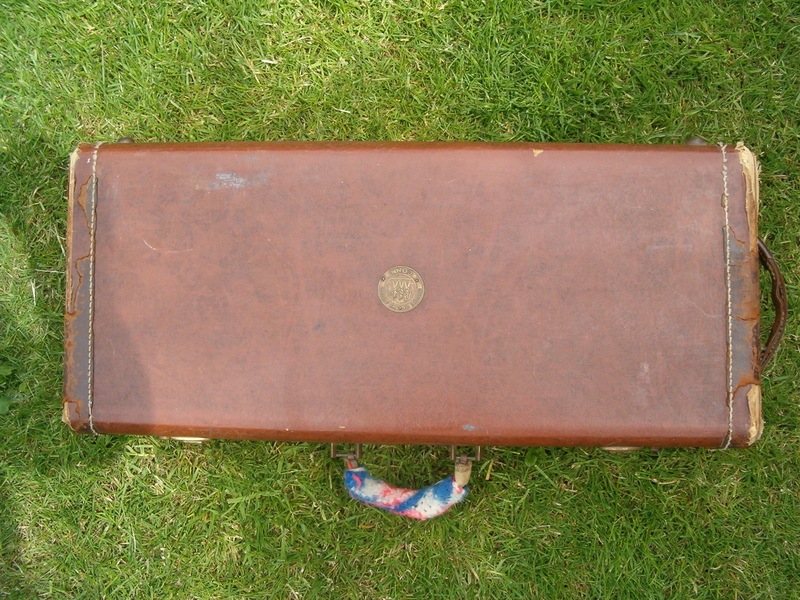 Luckily it had its original case, because the large key guard would make it hard to fit into a conventional case. In fact I had my local key cutting store fix the plastic handle with an appropriate looking one in red from a junk shop in Bridport, Dorset. The price tag on the case was $100 less than the assistant had quoted and, even though I then attempted and failed to get it for less, I was very happy at the price I paid that day (even without knowing exactly what it was). The 28M or Connstellation was one of the rarest Conns very made – just 10,000 in total. It was designed by Santy Runyonand sold for $382.50 in 1950 – the year mine was made – I got mine for less. Conn was the first musical instrument manufacturer to have its own laboratory, being one of the first to experiment with electric organs. 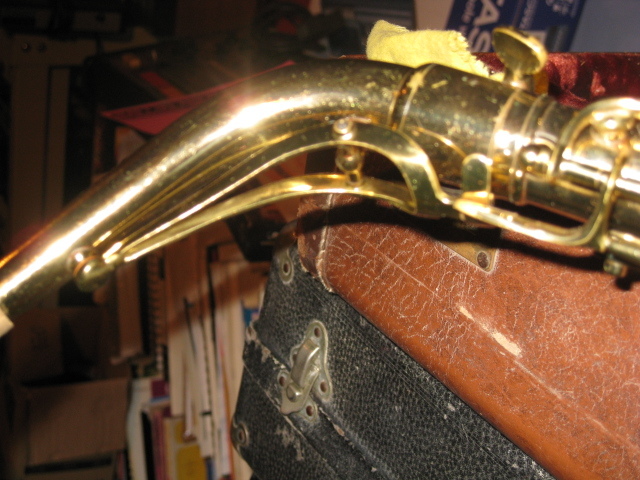 It also had a keen battle with Selmer and King to be used by the many modern jazz virtuosos from the 1940s onwards. The 28M entered fight with a very unusual design, with double octave key venting and the aforementioned key guard which has gold decals and a depiction of the three Conn marching men. The plastic on mine was brittle and broken in places, so I sent of for a ‘high impact acrylic’ replacement, which I bought for about $100 from Matthew Slauson in Auburn, New York. Once my excellent fixer-upper had checked out the screws I sand-papered the edges, drilled the holes and fitted it – it only took me a couple of years! Plastic and saxophones don’t really mix. I’ve never seen a 28M key guard in perfect condition and although I’m tempted to buy a Grafton, my suspicions are that time makes them more brittle – so even if you have one that’s uncracked, it’s only a matter of time before it goes. Unfortunately for the 28M the excellence of the design wasn’t matched by the quality of the materials – the brass is thin and has gone an orangy-red in the few places where the lacquer has come off. 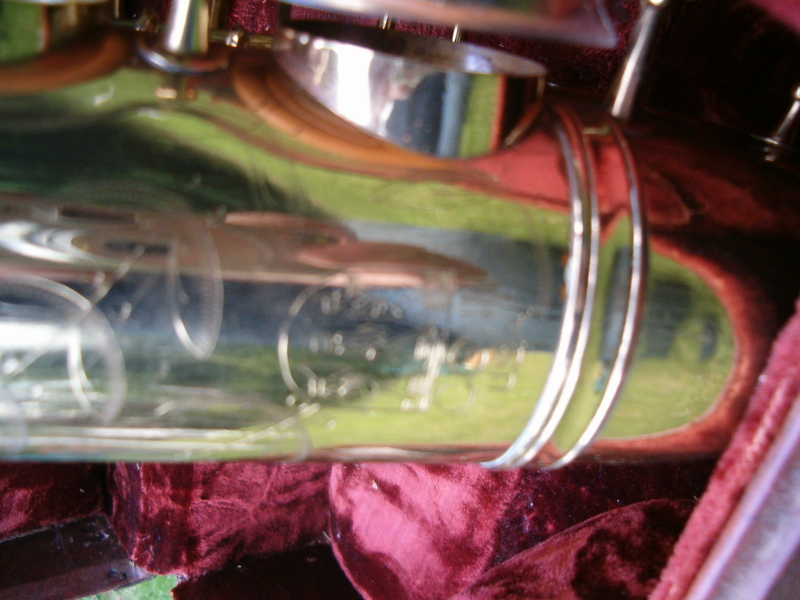 However my horn is in fantastic condition and has clearly been only played occasionally in the last 60 years. 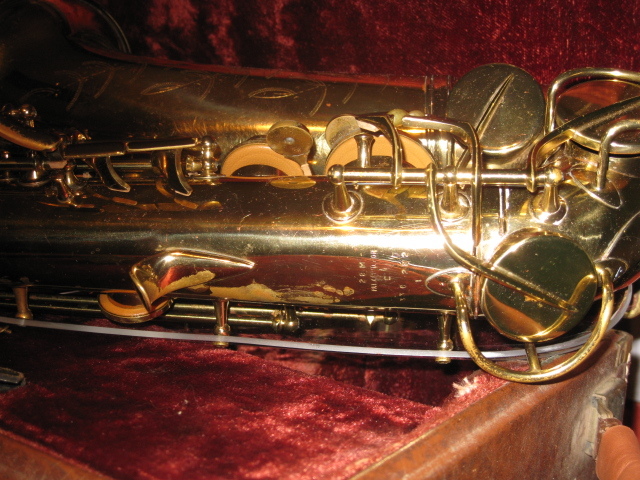 If there was ever a candidate for remanufacturing classics saxophones in China, this is it. I’d buy one in a heart beat. 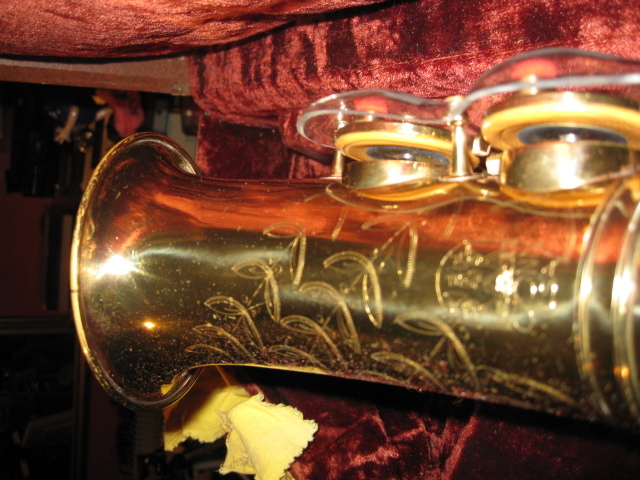 The poor quality brass makes this sax quite light in comparison with instruments such as the Conn 6M and Selmer Mark VI. Nevertheless the complete rethink Santy and/or the other Conn designers put into the horn make it the most balanced action you could imagine. The weight of the keys is light and the same across both registers. The sound is refined and modern, but without the volume or roundness of my favourite altos. I could, but haven’t yet, splash out on a Santy Runyon mouthpiece to make an even more authentic experiment with the design concepts. Actually I was quite surprised at how well it plays and sounds when making the video clip from my saxachronic chamber. There’s lots of information on the Conn 28M on the Web. 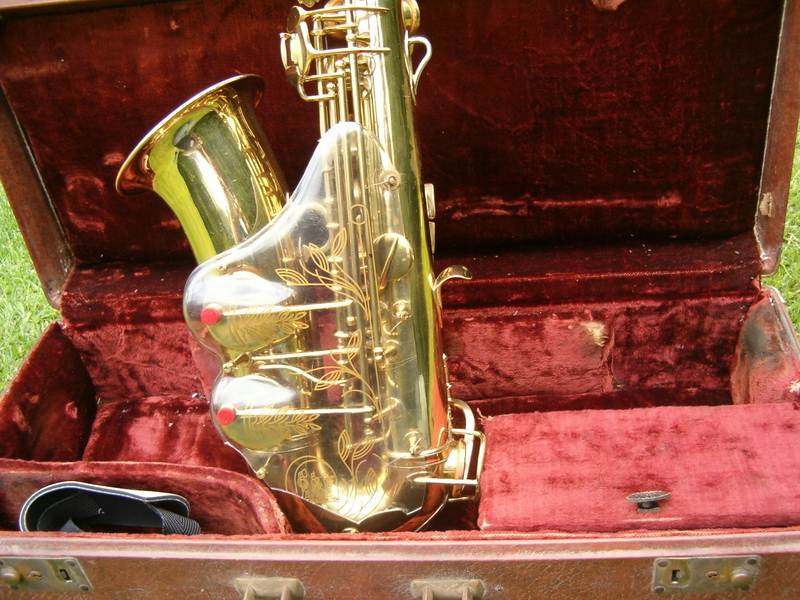 See saxpics for the best, including posters and the story of its unique features. Do you play one? How does its design features help? Let me know by commenting on this post. I bought a Connprototype from an American Collector and would love to run the story past you and see what you think. Of course Neville – let’s put some coverage of it up here if it makes sense to you. I have one of these for sale. Estate of dad, a full-time music teacher/musician. His since new. Did you sell your 28M yet? I have one and looking for the plastic (After Market) side-piece. Give me more details at hleveque@verizon.net if you still have it. Thanks. Try mslausonw@gmail.com – he said he was still making replacement guards 9 months ago. 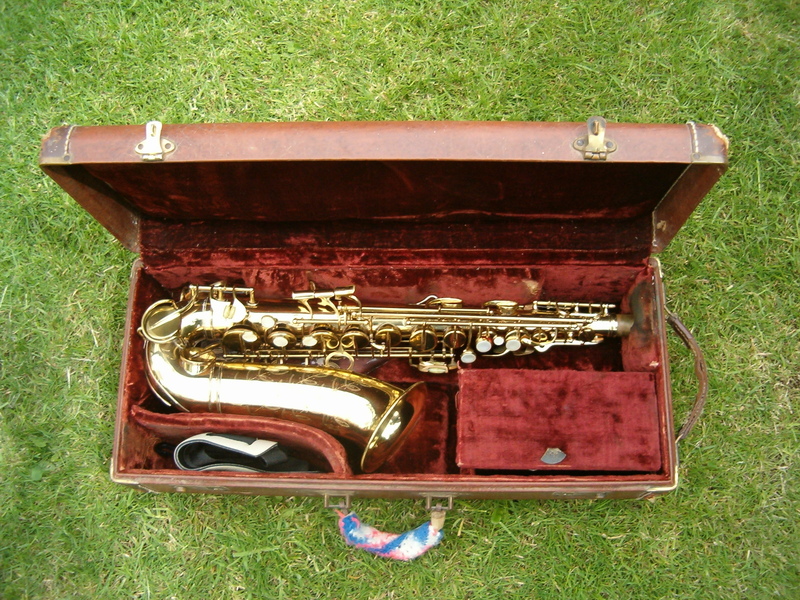 I actually did put it on e-Bay that day, and it sold in hours to a guy who specializes in saxes on e-Bay. 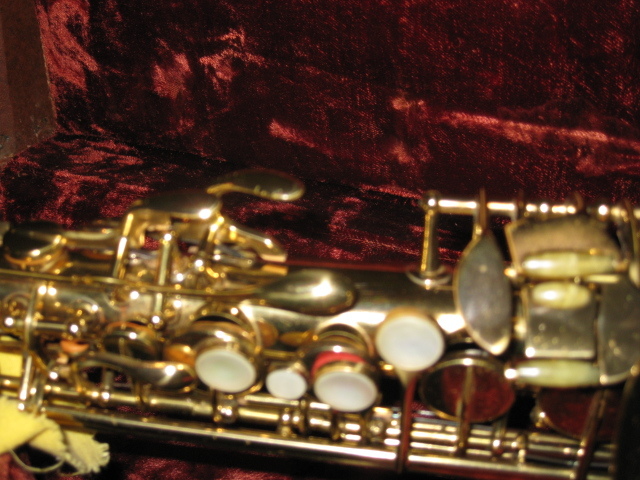 If you search for mouthpieces on e-Bay, you will find him (Mark) — 10mfan is his e-bay name. We both live in FL, so we met him to avoid delivery breakage. Great guy! I actually got over $1800 and was delighted. He loved the mouthpiece. He listed it again without the mouthpiece, and I have a feeling it sold again as it is not listed, but also doesn’t show a sell price. He probably made good $$ on both. I’d check with him on parts as all he sells is sax things. I was just glad to get it in the hands of “real and fine sax” people, so it has a good home from here on, Dad was devoted to music his lifetime. He always said that after he dies “he’d be playing in the band in Heaven.” Every so often I hear a melody! I replaced mine – only took me 2 years to ile down the edges of the acetate. I’ll try to find the supplier – he was based in the US. I do have those available. They are $135. I typically ask for payment via PayPal. I can send a PayPal invoice. I typically ship via USPS Priority mail. The shipping cost is $9.50. Let me know if questions. Many thanks – I can attest that the replacement works well. Steve should keep the original safe as well of course. I am a professional jazz saxophonist and have ideas for 3 new saxophone inventions that are not only sorely needed but will put your company back on the cutting edge of saxophone innovation. Please contact me for details!